As of January 1, California employers must comply with strict rules passed under the new Immigrant Worker Protection Act (AB 450), which protects workers in the state from immigration enforcement while they’re on the job. Under AB 450, all employers, regardless of size, must limit U.S. Immigration and Customs Enforcement (ICE) agents’ access to both the worksite and employee records, and must follow new notice obligations. The Labor Commissioner and the Attorney General have authority to enforce the act’s provisions and employer missteps can result in fines of $2,000 to $5,000 for a first violation and $5,000 to $10,000 for each subsequent violation. California employers can no longer consent voluntarily to allow ICE to enter nonpublic work areas or to access company records. Instead, ICE must present legal documentation in the form of a warrant or subpoena before employers can allow access. The employer can take a federal immigration enforcement agent to a nonpublic area to verify the warrant, as long as no employees are present and the employer doesn’t provide consent to search nonpublic business areas in the process. Employers cannot voluntarily allow ICE agents to gain access to, review or obtain employee records without a subpoena or judicial warrant. The prohibition does not apply to Form I-9 or other documents for which a Notice of Inspection (NOI) was provided to the employer. Employers must follow specific requirements related to Form I-9 inspections. For example, within 72 hours of receiving a Notice of Inspection, California employers must post a notice to all current employees informing them of any federal immigration agency’s inspections of Forms I-9 or other employment records. Employers also have obligations once the inspection is over. Within 72 hours of receiving the inspection results, employers must provide each “affected employee” a copy of the results and a written notice of the employer’s and employee’s obligations arising from the inspection. The written notice must contain specific information and must be hand-delivered in the workplace, if possible. An “affected employee” is one identified by the inspection results as potentially lacking work authorization or having document deficiencies. Unions also have the right to receive notices. An employer that fails to follow any of these notice requirements can be fined between $2,000 to $5,000 for a first violation and $5,000 to $10,000 for each subsequent violation. At the same time, federal penalties for Form I-9 violations can range from a couple hundred dollars to more than $20,000. California employers need to ensure that supervisors and any employees who are likely to interact with authorities arriving at the worksite are aware of the limitations on ICE access and the prohibition against voluntarily granting access without particular documentation. Consider designating a trained point-person(s) for front-line staff to contact if immigration agents arrive at the worksite. These individuals should be trained to ask for a warrant or subpoena. California employers also need to create and document processes to meet all pre- and post-inspection notice requirements. Since the 72-hour timeframes are short, standardized posting and notice processes will help employers meet their compliance obligations. The Labor Commissioner has until July 1, 2018, to create a model posting template. 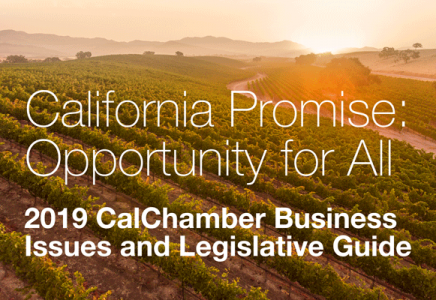 The California Chamber of Commerce has developed a template for CalChamber members to use to meet the posting requirement until the Labor Commissioner develops an official template. The CalChamber Notice to Employees: Government Inspection of Employment Eligibility Records is available for members in English and in Spanish in the Forms & Tools section on HRCalifornia.com. The act also makes it unlawful for employers to reverify the employment eligibility of current employees in a time or manner not allowed by federal employment eligibility verification laws. Federal law already prohibits unlawful reverification practices, such as reverifying unexpired documentation. The new state law adds an additional state civil penalty of up to $10,000. Compliance in this area is going to be tough and only time will tell what legal challenges this new law may bring. In the interim, however, employers will need to comply. Given the potential conflicts or confusion between an employer’s obligations under federal law and these new California requirements—as well as the federal administration’s statements that it intends to increase worksite enforcement actions in 2018—employers should consult a labor or immigration attorney with any questions or concerns. More detailed guidance is available on HRCalifornia.